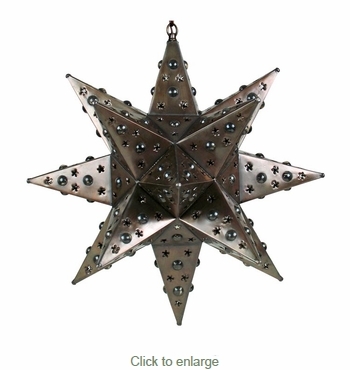 This small 14" aged tin star light is a unique way to add glowing warmth to any Santa Fe, Southwestern or Spanish Colonial décor. Hand crafted by skilled Mexican metal workers, this beautiful fixture is the perfect way to brighten up any room. Since each star fixture is hand crafted, color and finish may vary slightly from what’s pictured here. Chain and ceiling plates sold separately. Giant Natural Punched Tin Star Light - 3 Feet Dia.